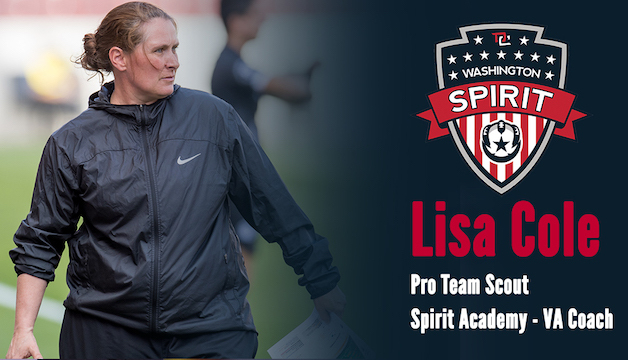 Boyds, MD (May 23, 2018) – The Washington Spirit has hired Lisa Cole in a dual role with the club at the professional and youth levels. Cole will serve as a coach with the Spirit Academy – Virginia program in the U.S. Soccer Girls’ Development Academy, and as a scout for the pro team. Cole joins the Spirit with more than 20 years of coaching experience at the pro, college and international levels. She was one of the National Women’s Soccer League’s original head coaches, leading the Boston Breakers during the inaugural season. Cole represented the Breakers organization from 2008-2013, including as an assistant coach from 2008-2010 in Women’s Professional Soccer and as head coach in WPSL ELITE from 2011-2012, when she led the club to a regular season championship. Cole joins the Spirit following a brief stint as an assistant coach with the Houston Dash. At the college level, Cole spent two seasons as head coach at the University of Rhode Island from 2003-2004. She served as an assistant coach for the Florida State University women’s soccer team from 2005-2006, helping lead the Seminoles to the 2005 NCAA Final Four. From 2000-2003, Cole was an assistant coach at the University of Connecticut. During that time, she helped head coach Len Tsantiris lead the Huskies to two NCAA women’s soccer Elite Eight appearances and one Sweet 16 appearance. The Huskies won three straight Big East regular season championships during Cole’s time with the team. Cole started her collegiate coaching career as an assistant coach with the University of Mississippi women’s soccer team from 1997-2000. During her three years at Ole Miss, she was a part of the team’s first SEC Western Division title. On the international level, Cole headed the Papua New Guinea U-20 Women’s National Team during the 2016 U-20s Women’s World Cup; the team’s first appearance in the tournament, where they also served as hosts to the bi-annual FIFA event. Prior to her coaching career, Cole was a goalkeeper at Pacific Lutheran University from 1993-1997, where she still holds the school record for most saves in a season.